"LaureNicole", formerly known as Lauren Nicole Band, was formed in 2014 and consists of four members: Lauren Nicole (vocals, rhythm guitar, songwriter), Evan Bennett (bass, backing vocals), Griffin Prufer (lead guitar), and Ryan Whitcher (drums, percussion). The band has a balance of original compositions and covers and plays regularly in their home state, North Carolina. Lauren Nicole, now 23 years old, has written over 40 songs and recorded two albums over the past few years. She has played both acoustic and electric guitar for nearly 10 years. Prior to forming her band, Lauren recorded and released her first album, "Hope & Desire," as a solo artist in 2011. The album was produced by Chip Shearin who has worked with renowned artists such as Christina Aguilera, Janet Jackson, and Aretha Franklin. Shearin is primarily known for his iconic bass line in "Rappers Delight" by the Sugar Hill Gang. In the past two years, Lauren has reached several milestones: completed a 30-day crowd-funding campaign to record a 7 song live EP in Miraverse/Manifold studios, won the Bands4Good challenge and raised over 3,000 dollars for homeless veterans in North Carolina. Lauren was also nominated for Best Female Rock Artist of the Year at the 2014 Carolina Music Awards. Evan Bennett, 22 years old, has been playing bass guitar for nearly 10 years. He joined this project in October of 2013 and since then he has been heavily involved with the band's songwriting and arranging. Evan has heavily influenced the direction of the band's songwriting by creating unique instrumental guitar parts. In the past year, Evan has also encouraged the band to go in a more mainstream rock vein. His influences include Victor Wooten, Flea, Duff McKagan, Mike Mills, Chris Wholstenholme and many more. Ryan Whitcher, 21 years old, has been playing drums for 10 years. Ryan joined "LaureNicole" in September of 2014 and since then he has truly become the backbone of the band. After searching long and hard for the right drummer, Ryan came along and offered a fresh, clean, and dynamic sound to the band. Although this is Ryan's first project, his fans say his abilities and talents are greater than his years. His influences range from Neil Peart, Mick Fleetwood, and John Bonham. Griffin Prufer, 20 years old, is originally from Greensboro NC and the newest member of "LaureNicole". He has been playing guitar consistently for 10 years. Griffin is also a student at NC State University and is currently studying textile engineering. Griffin brings a commercial, edgy, and modern rock sound to the band. 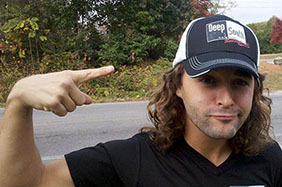 Griffin's influences include Led Zeppelin, Eric Clapton, Van Halen, Red Hot Chili Peppers, and Pink Floyd. In recent news, "LaureNicole" is excited to be collaborating with one of the music industry's top producers and sound engineers, John Davenport. Davenport has worked with acclaimed artists such as The Rolling Stones, Bruce Springsteen, Cindy Lauper, John Lennon, and is credited on several platinum albums. The band has recorded its first album with Davenport in his new state-of-the-art facility, Deep River Studios, located in Sanford, NC. The album, entitled "Light the Way," is scheduled for release in the fall of 2015.